5 or 10 Million USD would put you well out of the same economic stratum as almost everyone. Just saying. Do you think I should use a different interval in my example? Write it in a different way? Or just exclude the example? I actually put it quite high, because I kinda wanted to say that we can tax the rich people more, without it hurting them much. I see. Maybe I'd point out the economic result that the utility of money is logarithmic, and take some derivatives, or something? 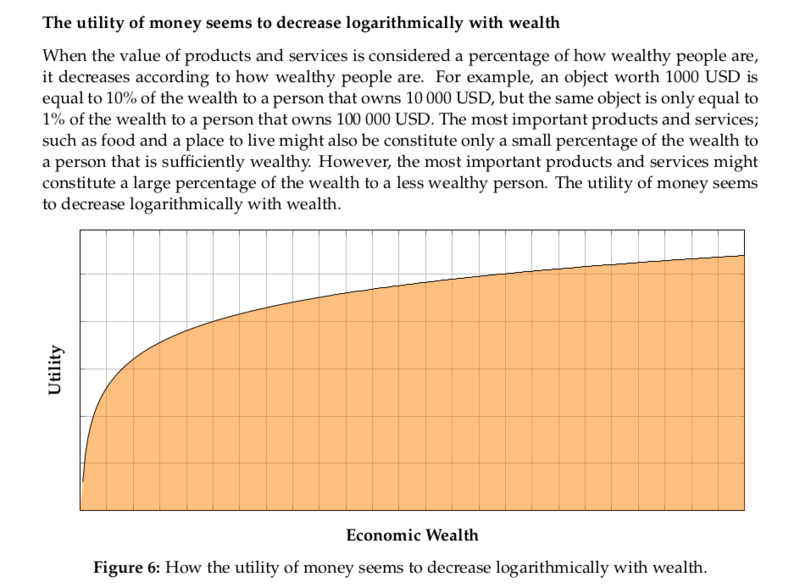 Are you sure it is logarithmic? 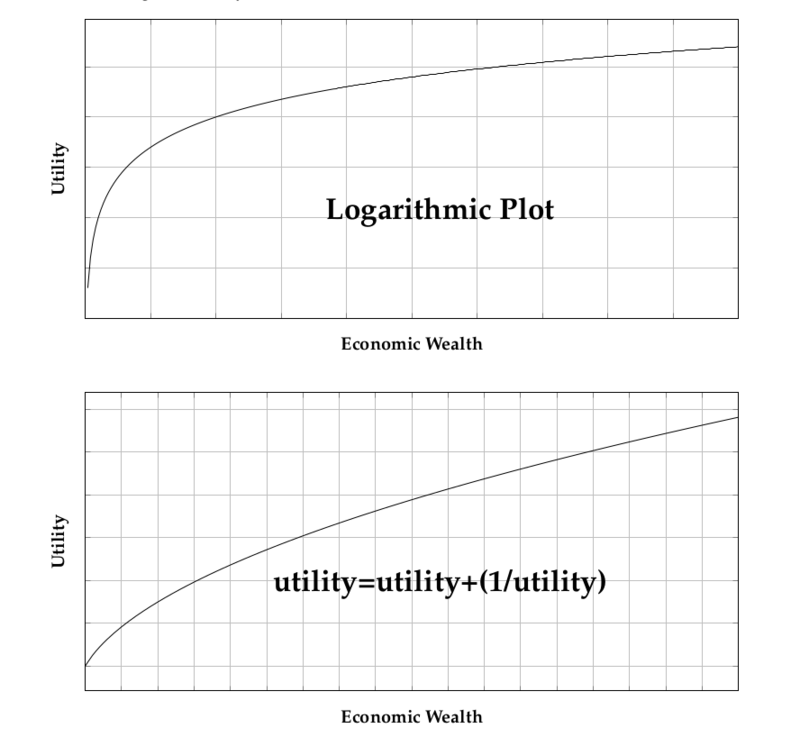 My intuitive understanding about how the value of 1 USD decreases according to how wealthy people are, would be something like "utility=utility+1/utility". Plus, it's shaped all wrong. Once you have enough, money does get less useful, but that other expression just keeps going up. I would not suffer particularly if I lost $20 (indeed, that could well have occurred without my noticing). If I were on the streets, I would DEFINITELY miss it. Your expression covers that side… but In the other direction, if I were to lose $2k, that would hurt. On the other hand, someone with even just ten times as much money as me would have to work to notice a loss like that. And there's some amount that would hurt them but be insignificant to someone more wealthy, and so on. Logarithm covers that in a scale-free way. X + 1/X does not. Do you agree with this? I don't understand why this simple understanding isn't more prevalent among economists, and so on. I feel kinda unsure about if this really is true since I can't find many other people claiming the same. This seems so obvious though, that I feel like it must be true. Am I missing something? How do you end up with a negative situation like that? No one having money at all would be a serious beyond-wowza-broken economic situation of a liquidity trap. Well, lets imagine that Person B, Person C, and Person D got some horrible disease. For example cancer. Now, Person A invents a medicine against cancer, and uses this medicine to heal Person B, Person C, and Person D.
In the first graph, they all pay him 3 units of money, so Person A gets 9 units of money. In the second graph they all owe him 3 units of money. My point is that the 2 situations are more or less identical. Person A doesn't necessarily care if they pay him or owe him money. Especially not if they are trustworthy individuals, but the value of money is also to some degree based upon communal trust. I don't find that a very compelling argument. 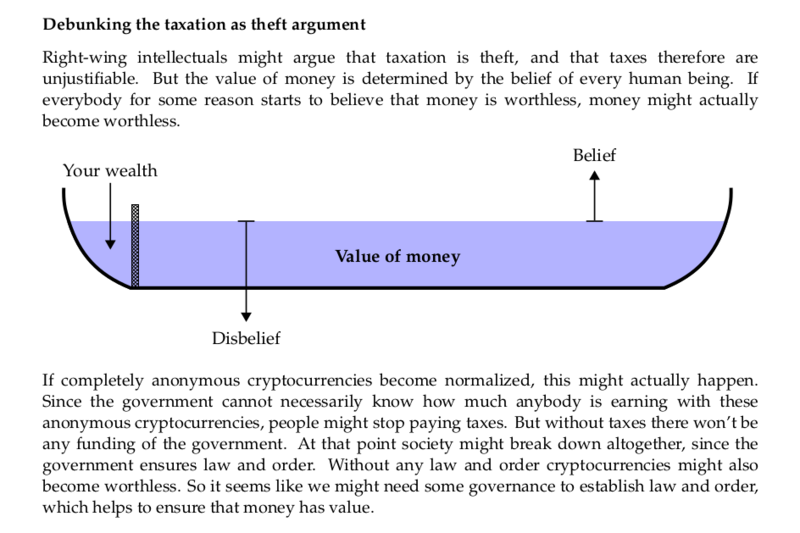 Have you read Scott Alexander's Non-Libertarian FAQ? I think he makes a better case there. I agree that the argument sounds a bit weak now, but I think the core of the argument is valid. I just need to find a better way to explain myself. In essence, I think it might be wrong to assume that you own money, since the value of money is ensured by the community/government. It might be more appropriate to think of money as something you are renting from the community/government, and then taxes would be something like interest rate to the community/government. Anyhow, I will read through Scott Alexander's Non-Libertarian FAQ. I also believe you suggested a book review written by him related to perceptual control theory. You really like this guy? I also see that he has written an extensive anti-reactionary FAQ which seems to be more or less aligned with my views. In the first one, if everyone started with 3, and B, C, and D paid A 3/each, then A should have 12, not 9. In the second one, it seems like the graph includes debts owed as liabilities, but not debts collectable as assets, but it makes no sense to treat these inconsistently, especially if you're not considering default risk. So the numbers here should be 9, -3, -3, -3. Finally, I'm not sure how one can draw any real conclusions from the graphs. 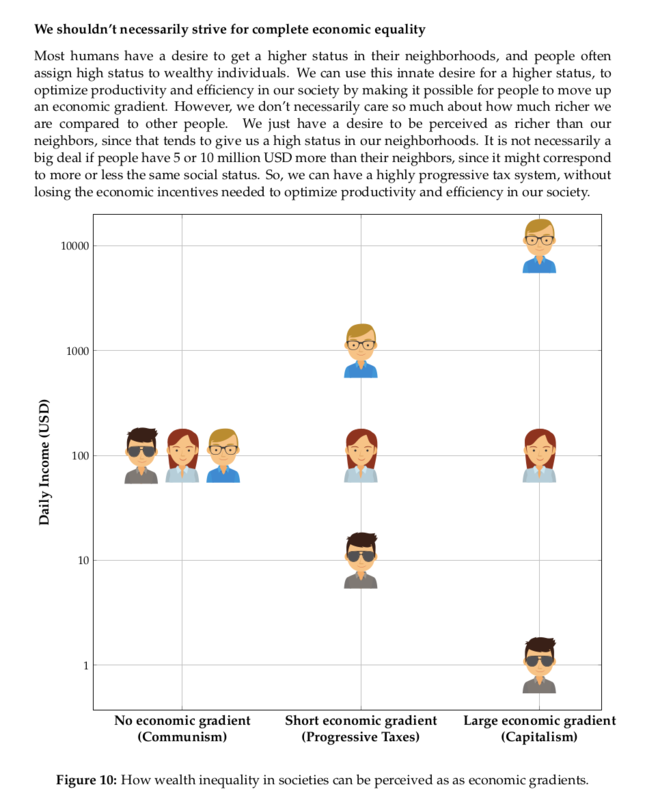 While wealth disparities are certainly real, you haven't provided any evidence that wealth disparities in the real world are actually caused or perpetuated by the sort of transfers that the graph postulates; they're more often attributed by economists to the relative returns on labor vs. capital. I'd suggest reading Piketty, who wrote extensively on the subject. Just make sure to also read some critiques of his work, to balance your perspective. In the first one, if everyone started with 3, and B, C, and D paid A 3/each, then A should have 12, not 9.. I actually didn't think that they needed to start with the same amount. But that sounds like a more elegant example, so I will change it. Finally, I'm not sure how one can draw any real conclusions from the graphs. 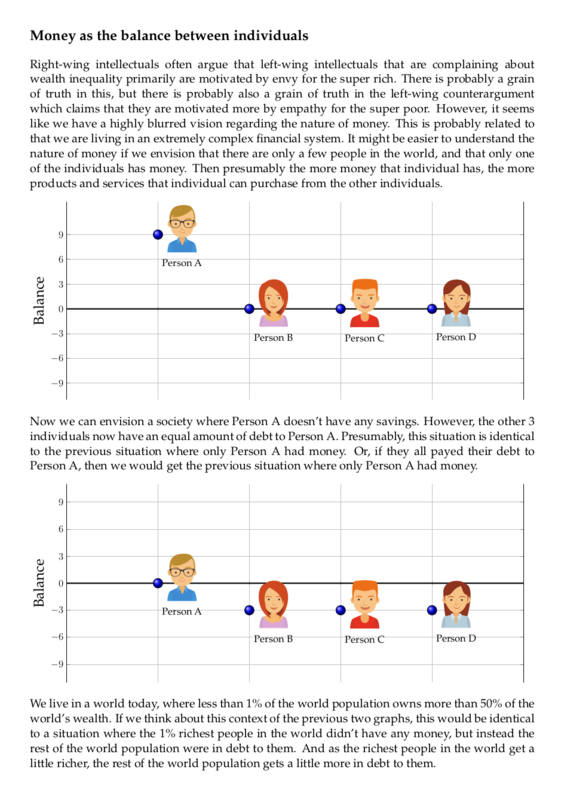 While wealth disparities are certainly real, you haven't provided any evidence that wealth disparities in the real world are actually caused or perpetuated by the sort of transfers that the graph postulates; they're more often attributed by economists to the relative returns on labor vs. capital. People aren't necessarily convinced that extreme wealth inequality is a bad thing. Our brains aren't wired for economics. Our brains are mostly wired for collecting food. I suspect that most people think of money as having inherent value in itself, similarly to how people would think of food before we invented money. With food inequality, you wouldn't necessarily care so much if other people had more food than you, as long as you had enough food for yourself. Some of these graphs are made to convince people that extreme wealth inequality is a bad thing, even if they have enough money for themselves. I'd suggest reading Piketty, who wrote extensively on the subject. Just make sure to also read some critiques of his work, to balance your perspective.